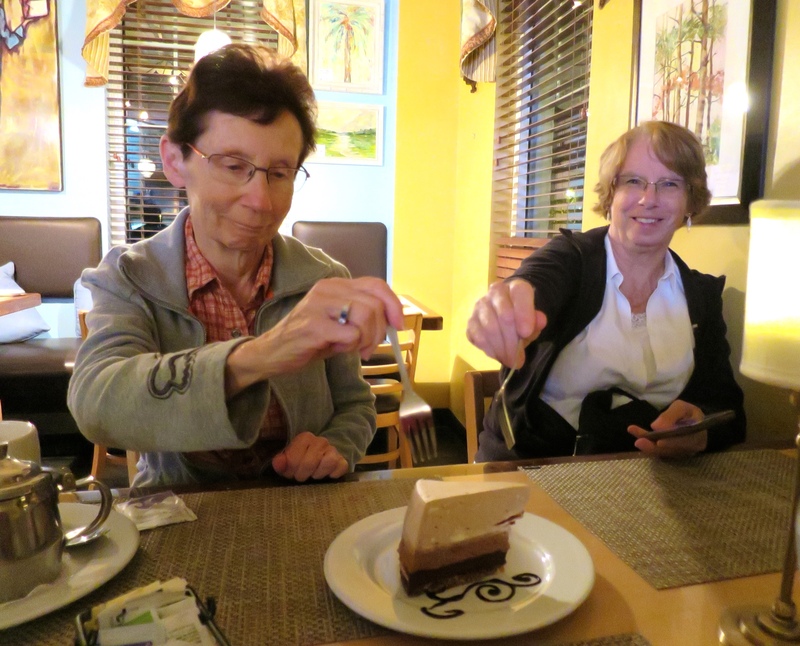 Welcome to Myrtle Beach Seminar 2015 | NJNA is Blogging! I arrived at the Sheraton this afternoon in prep for Seminar classes starting tomorrow. After checking in, I registered and then visited the the boutique, which is run by The Needle Nest of Columbia, TN. They have lots of painted canvases, especially some interesting ones that once stitched are finished as 3D sweater ornaments. 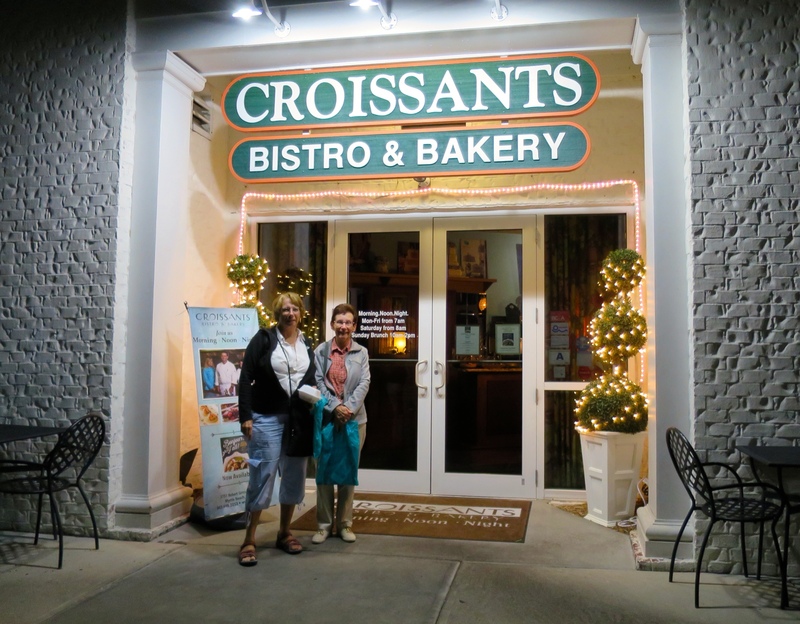 Then Sue, Rosie, and I found an interesting little restaurant called Croissants Bistro & Bakery and had an awesome dinner. It started with the fresh, hot baguette they brought to our table with cream butter with Maldon sea salt and black eyed peas hummus. For those who don’t know, Maldon sea salt is from England and is hand-harvested with the distinctive flaky texture and taste that lends a certain piquancy to virtually any dish. Sue was looking for something light so she had crab asparagus salad with avocado and mandarin orange vinaigrette. Rosie was also looking for something lighter so she had 2 appetizers: mini crab cakes and then tuna poke with balsamic vinaigrette for which she also asked for some extra baguette, which was a perfect complement. I decided to go with a regular dinner of the Bistro Chicken, which was 2 large chicken breasts stuffed with prosciutto and cheese on a bed of pasta, spinach, dried tomatoes, and tomato sauce. It was to die for and I even have lunch for tomorrow! 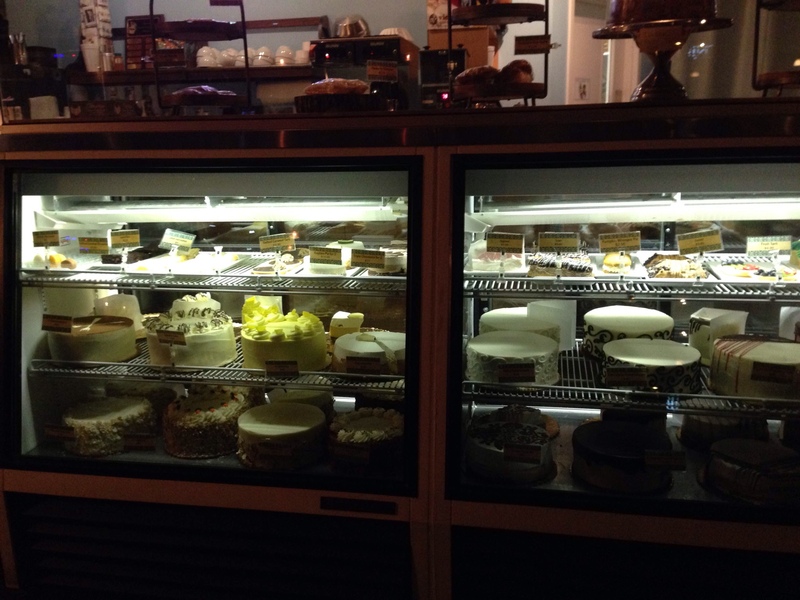 Then Sue and I decided we needed to have dessert after looking at this wonderful display case for the entire meal. 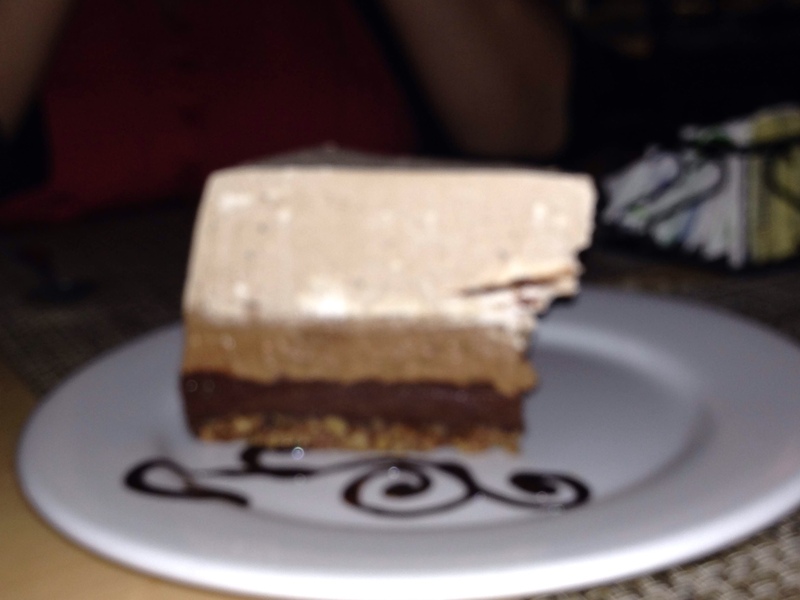 We chose the triple chocolate mousse cake, which like the rest of the meal was outstanding. For those attending Seminar and looking for an interesting place for dinner, we highly recommend Croissants. Its website is http://www.croissants.net and it’s a 5 minute drive from the hotel. Now, it’s time to get some sleep as class starts at 8:30 tomorrow. My stitching bag for Toni Gerdes’ Autumn 3 Ways class is ready to go! Bill and I had breakfast there. Steel oatmeal with granola and the strawberry waffle was delicious. Very nice place.